I have a daily ritual: every morning, when it's still too early for me face the news, I skim glossy cookbooks while I groggily eat my breakfast. Sure, my actual breakfast is totally boring (black tea and an English muffin), but I find looking at pictures of beautiful food to be extremely soothing. 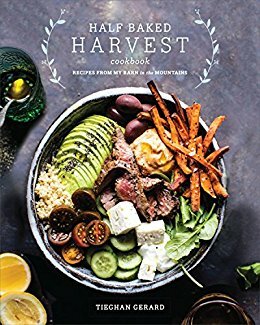 That is why I am so fond of the popular website Half Baked Harvest, and why I decided to review author Tieghan Gerard's new cookbook of the same name. In addition to being full of excellent recipes, I knew I could count on Gerard to provide me with exquisitely-photographed breakfast reading material for many meals to come. The recipes I chose were universally delicious, time-consuming, expensive, and incredibly messy. Even when the recipe itself didn't require a huge time commitment, it usually took me over an hour to clean everything up. (The author has mentioned that her father does her dishes; I hope he receives a portion of the proceeds of this book, because that is a gift.) Gerard has a talent for blending unusual flavors into a delicious whole, and I enjoyed every mouthful—but if you're like me, this is the kind of book that you enjoy looking at all week long, but really only cook from on the weekends.